Are you having people over for Easter dinner? If so, you’ll need to have at least one impressive dessert at the table. Cheesecake offers a perfect finish to a wonderful Easter meal, and it can be prepared ahead of time to save stress on Easter. It’s also a crowd pleaser because everyone loves cheesecake! 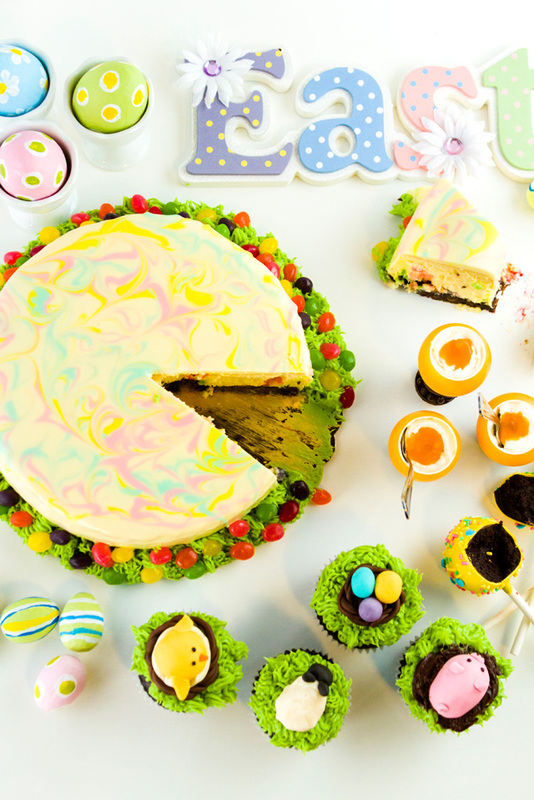 Instead of serving a classic cheesecake, why not try some of these Easter themed variations? Peeps are a classic Easter candy and they even taste great in cheesecake! Even though this recipe uses strawberry flavored Marshmallow Peeps, you can substitute for any type of Peep that you like. However, strawberry is a great flavor for spring since it is in season right around Easter time. If you can find the Strawberry Cream Peeps listed in the recipe, using them will make the cheesecake even more appropriate for spring. Carrot cake is a classic Easter dessert because carrots are associated with the Easter Bunny. Rather than serving a simple carrot cake for dessert, why not merge it with cheesecake? The delicate flavor of the cheesecake lightens the spicy flavors in the carrot cake, making it a perfect dessert for spring. Even though it’s a religious holiday, in many ways, Easter is also a reminder that spring is finally here! If you had a long winter, why not celebrate spring with a rainbow cheesecake? The basic idea is that you use a classic cheesecake recipe that has been colored with food coloring. If you would like to follow your own cheesecake recipe, you can still use the instructions in this one to create the rainbow coloring. Garnish it with rainbow sherbet and in-season strawberries to add even more color. This strawberry shortcake cheesecake merges the two classic desserts. In this recipe, the crust is made from shortcake rather than graham crackers. When paired with strawberries and the cheesecake filling, you’ll have something unique to serve your Easter guests. Easter just wouldn’t be the same without jellybeans! This year, you can take it one step further and make a jellybean cheesecake! If you have a classic cheesecake recipe that you love, you can prepare that as usual and use the jellybeans to garnish it. You can also prepare one recipe of cheesecake, dust one cup of jellybeans in flour, and fold the jellybeans into the batter to make a jellybean confetti cheesecake. In Italy, people serve a traditional Easter cake, called Colomba di Pascqua, every year as part of their Easter dinner. This Italian Easter cheesecake takes the classic flavors of the original cake and turns it into a cheesecake. The thing that makes this cheesecake unique is the anise flavor, which is actually used in a variety of Italian desserts.